If you've browsed Barneys recently, then you've probably seen Greg Lauren's designs there. Greg is an unbelievably talented artist, humanitarian and clothing designer. I have the pleasure of knowing Greg and have watched him turn his vision into reality. His hand made, one-of-a-kind, military inspired designs all have a unique deconstructed look to them that only Greg can do. 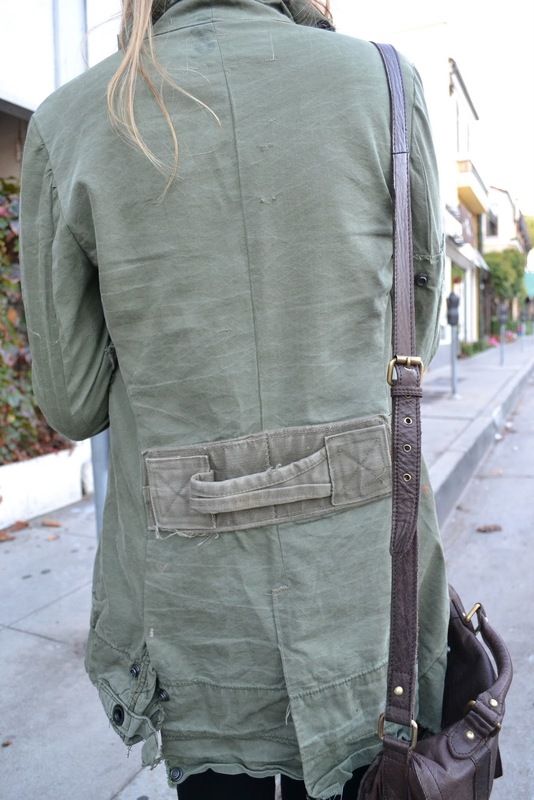 My jacket (made out of vintage army tents) was a birthday gift and is by far my favorite item in my closet. I wore it out on a cool afternoon and threw on my red scarf for a pop of color. If any of you are in NYC, you can visit Greg's current installation, titled "Barracks" located at 125-127 Grand Street now through the end of December. Click here to see Greg's recent feature on Stylelist.com. You can see more of Greg's designs by visiting Barneys and his website by clicking here. Such a unique jacket! I love the pop of red. Looking great as always! Vintage army tents?! How cool! Love that you paired it with a red scarf... it gives it a festive look and great pop of color :) Happy Wednesday! love the jacket! and great job pairing it with a red scarf! Adoring that jacket! Great take on the parka; love the raw edges and the cut and color! This is so cool. You look great. That jacket is mega awesome. such a cool idea, what a special piece! That jacket is made out of recycled army tent??? That is so great! It's beautiful and earth-friendly. :) I love how you've styled it. Love the neutrals in this outfit with the pop of red! Glad I found your blog, following now! thanks for sharing! I really like the details on that jacket! Love how the vivid cranberry scarf adds a pop of color and punches up the neutral look! Gorgeous jacket! It looks amazing with this scarf! Greg is such an amazing artist and designer. That jacket looks fabulous on you!